In honor of Presidents' Day today, I'm returning to gargoyles of the United States. In my first post last month, I gave a teaser photograph of a broken statue from the Brooklyn Museum sculpture garden (formerly the Frieda Schiff Warburg Memorial Sculpture Garden when I first visited, now called the Steinberg Family Sculpture Garden). 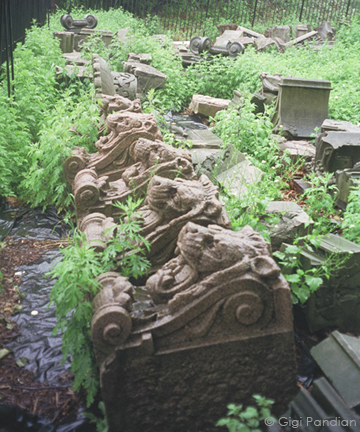 This is a garden where massive stone carvings live after being rescued from buildings set for demolition. I love that there's a place where gargoyles, grotesques, chimeras, green men, and artists' sculptures of all kinds can be saved when their buildings can no longer survive. The first two photos below are from my first visit to this garden in the 1990s, when the landscape was more overgrown and haphazard. It was pouring rain (I always seem to travel off-season) and tendrils of ivy and weeds curled around the stone figures. When I returned a few years ago, after the garden was redesigned in the year 2000. The grass was no longer overgrown, and many of the statues I remembered were nowhere to be seen. There were still some fabulously detailed carvings, like the two faces below. I'll be headed back to NYC this summer, to attend Thrillerfest for the first time. I'll be sure to slip out for a few hours to go back to this sculpture garden to see what it's like today. 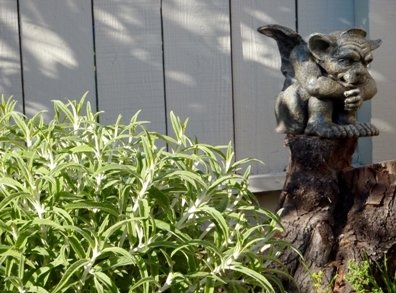 Lastly, here's a gargoyle who's even closer to home -- a new little creature we installed in our backyard last weekend. He seems to have survived the hail storms this week, so I think he's here to stay. I LOVE your little garden guy, Gigi! Thanks so much for sharing him. 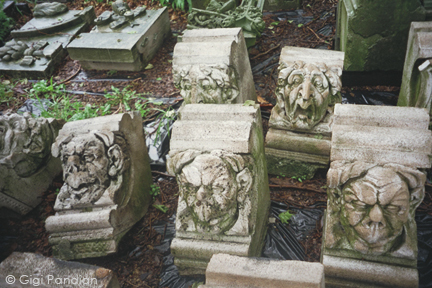 We could consider all those sculptures to be in a gargoyle graveyard, a gargoyle reunion, or a gargoyle celebration. I prefer to think the latter. I'm trying to decide: if I were a gargoyle, which one would I be? I want I want!!! 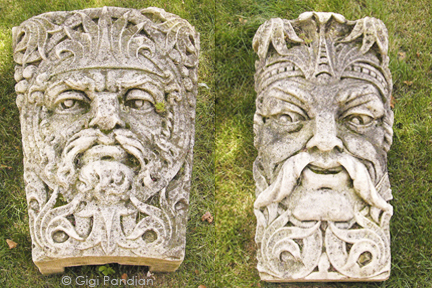 This sort of thing makes me feel so acquisitive -- I adore these gargoyles and sculptures! 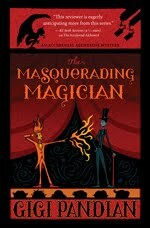 And your new garden guy looks a lot like my fictional Oscar in my books -- like Irving from NYC, right? 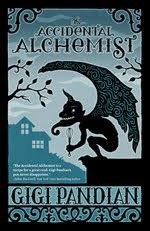 Julie, yes I love that guy in part because he reminds me of the Irving Place gargoyle in NYC! And you know Oscar is one of my favorite parts of that series.